Her acknowledged warmth and musicality have accorded her a place of preference among the audiences that have applauded her at such major stages as the Weill Recital Hall of Carnegie Hall and the Frederick P. Rose Hall of Jazz at Lincoln Center in New York, London’s South Bank Centre, Kennedy Center in Washington D.C., and the National Concert Hall in Dublin where she performed as a soloist of the Irish Radio and Television Orchestra, or Flagley Studio 4 in Brussels where she performed with the Brussels Philharmonic Orchestra for the Belgian National Television. She also had the honor of opening the Summit of the First Ladies of the Americas attended by then–First Lady Hillary Rodham Clinton. Most recently, Berta has toured with Cuban saxophone player and 11-time Grammy winner Paquito D’Rivera with whom she recorded the album Día y medio (Day and a Half). This recording was nominated in the “Best Instrumental Album” category of the XIII edition of the Latin Grammys. Berta maintains a prolific recording schedule. Her CD Intimate Barrios is one of the most celebrated recordings of the works of the great Paraguayan composer and guitarist, Agustin Barrios Mangoré. It glows with the delicate insight and feminine touch this virtuoso performer brings to the music of Mangoré. 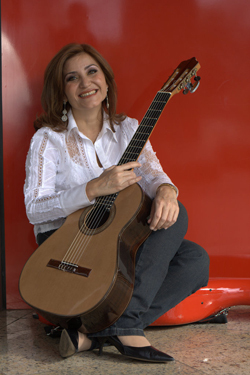 With her albums Cielo Abierto and Terruño she has won great acclaim from critics, presenting a personal and renewed repertoire for the classical guitar. Furthermore, the album Alma y Corazón provided the opportunity for concert tours with Carlos Barbosa-Lima. In addition to continually enriching her own artistic career through frequent international tours, presenting concerts and giving master classes, Berta Rojas is firmly committed to furthering and disseminating the classical guitar. This has a particular focus on promoting the music of her country, Paraguay, as well as Latin American music, and includes her ongoing support to the careers of young upcoming artists.